acknowledged that there would be an estimated $36 million in "construction inflation" bringing the cost to $293 million. 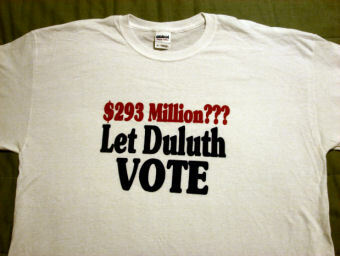 This led to the first anti red Plan logo wear for Let Duluth Vote. 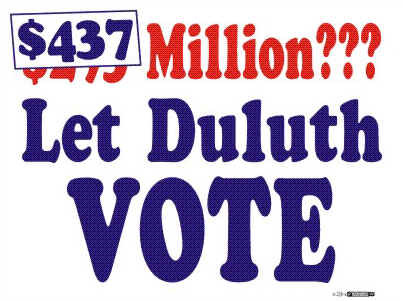 Of course, Let Duluth Vote pointed out that in addition to the actual construction cost there would be inflation which led to the change in our logo which was placed on our lawnsigns and which is at the top of every page on this website. Critics complained that it was not fair to include this cost although the taxpayers will have to pay it as well. Now the price has jumped yet again. 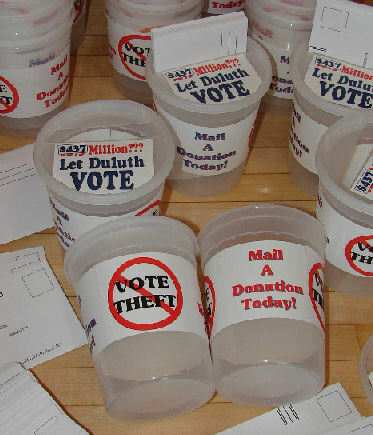 $10 million has already been spent on the Red Plan, primarily for Stowe and Lakewood schools. Even before construction begins on the rest of the projects the projected bids for the remaining construction are $296 million. That's the figure at the bottom of the following page. Added to the $10 million spent already the Red Plan will cost $306 million not including interest. 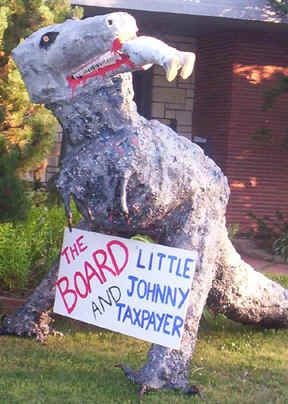 Oh, and the School Board borrowed $5 million from the classroom to pay for the Red Plan construction. Meanwhile our classrooms are bursting at the seems and the District is contemplating a four day school week. Is this how we are going to entice students back into our schools?